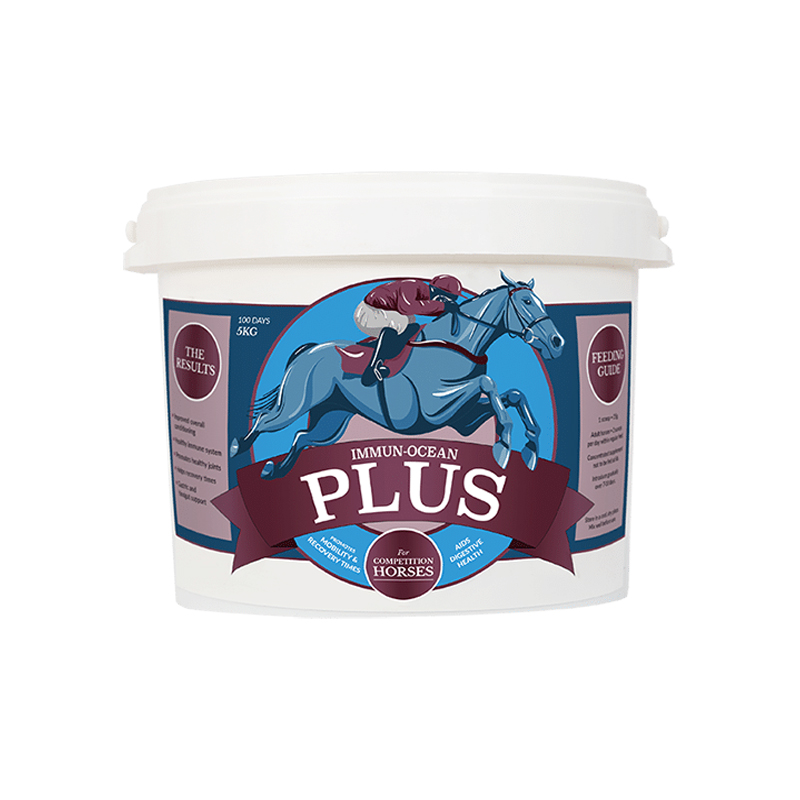 Immun-Ocean Plus is a natural feed supplement, comprising of Ascophyllum nodosum and Lithothamnium, which is specifically formulated for performance horses. It provides a balanced blend of vitamins and minerals, which support immune health, bone density and joint mobility. It also helps reduce stress reactions, improves recovery times and aids gastric and hindgut digestion. Ascophyllum nodosum seaweed, from the cold North Atlantic, has been used for centuries as a natural feed supplement, low in iodine and rich in vitamins, minerals and amino acids. It is composed of 48 elements, 16 amino acids and 11 vitamins. The macro algae are hand harvested in accordance with sustainable and traditional methods, which have been used for centuries along the Atlantic coastline of Ireland. This supplement is 100% natural and contains a balance of minerals, vitamins, amino acids and antioxidants that help to promote a healthy immune system and aid the overall wellbeing of the horse. Available, in powder form, in 1.5kg and 5kg tubs. Lithothamnium, magnesium oxide, yeast, live yeast, macro algae, flax oil, ascophyllum nodosum low temperature dried granules, calcareous marine seaweed (lithothamnium) spp and other minerals. Cadmium 0.38 mg/kg, Copper 160 mg/kg, Fluoride 370 mg/kg, Iodine 150 mg/kg, Lead 0.38mg/kg, Magnesium 48000mg/kg, Molybdenum <3 mg/kg, Nitrogen 0.95%, Phosphorous 680 mg/kg, Potassium 5600 mg/kg, Selenium <3 mg/kg, Zinc 370 mg/kg. Immun-Ocean Plus does not contain any ingredient known to contravene the Jockey Club, FEI or BSJA rules. Immun-Ocean Plus is free of contaminants such as caffeine, theobromine, hyoscine, hordenine, morphine and atropine. Note: the values listed above are typical. Components of Immun-Ocean Plus are natural products of marine origin and as such, are subject to seasonal variation.